Florida- The wooden steamer (271'x40'x15') built at Buffalo in 1889. Sank in 210 feet after she was struck by the steamer George W. Roby on May 20th 1897. Upright and very intact. Cornelia B. Windiate- Found by Paul Ehorn the same morning in May 1986, that his colleague John Steele, found the Norman near by, the three masted schooner (138'x26'x11'), built at Manitowoc WI in 1874. Disappeared with all hands after leaving Milwaukee for Buffalo with a cargo of wheat. She sits upright and very intact in 180 feet of water. John J. Audubon- Lies in 178 feet of water north Presque Isle. Built in 1854 at Cleveland, the 370 ton, two masted brig sank later that same year. The Audubon lies mast up stern broken. Typo- The three masted schooner Typo (138'x26'x11') built at Milwaukee in 1873, sank six miles east-southeast of Presque Isle light. The wreck sits upright and intact in 155 feet of water. Norman- Found by John Steele May 1986. The steel steamer (296'x40'x24') sank in the thick fog after a collision with the Canadian steamer Jack on May 30th 1895. She sits intact on a 45 degree list too port in 210 feet of water. She lies in 190 ffw South of Presque Isle. One of the best dives in Huron. F.T. Barney- Very Historic Ship in 160ffw just a few miles off Rogers City. Kyle Spangler- Found by Stan Stock recently, i had a chance to view the film of this wreck... we all are waiting to get on her Stan !! Southern Lake Huron Wrecks we visit ! busy shipping lane and caution is the name of the game here. We also have experienced some very strong currents in this area. This wreck is easily in the top 10 in lake Huron dives so give me a call if you feel like diving her ! five miles apart. This wreck is visited by very few divers and once again we will be there this season ! Known as the Straits Of Mackinaw this area is home to dozens of shipwrecks, dating back to the 1600s. This area holds many secrets for the technical diver, and to date is still not fully explored. Eber Ward- A 213 foot steamer that was cut by ice and sank in 1909. She lies upright & intact in 145 feet of clear upper Michigan water. She is located about 5 miles of the famous mackinaw bridge. The Eber Ward is one of Lake Michigan's very best. Sandusky- A 110 foot , two masted schooner with a square stern & a ram's head shaped figure head, built in1848 in Sandusky, OH. On September 18, 1856 she met her final fait. She took on water & foundered in heavy seas & sank. She lies upright & intact in 110 feet of water, approximately 6 miles west of the Mackinaw bridge. Minneapolis- She is a 226 foot, combination propeller and three masted sailing ship, cut by the ice in the early spring of 1894. She is upright & intact. 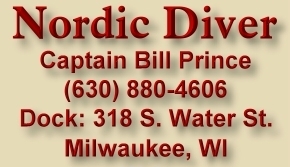 Located almost directly under the Mackinaw bridge & is well worth our time to dive her. Cedarville- One of Lake Michigan's largest shipwrecks at a length of 588 feet, a steel self loading freighter built in 1927. On May 7 1965 she was running fast in the fog & collided with a Norwegian freighter And capsized in 120 feet of water. Her final resting place is about 3 miles east of the Mackinaw bridge. Very intact & exploration of the interior of her by qualified technical divers is very exciting. Maitland- A 137 foot wooden sailing ship, known as a bark. She collided with the schooners Mears & Golden Harvest & now lies in 85 feet of water. She is upright & intact! Uganda- Was a wooden- hauled steamer that was 291 feet long. Her haul was cut by ice during an early season trip to Buffalo, NY. The Uganda lies in 210 feet of water. The deck can be reached at 185 feet. She is intact & very few choose to venture this far out, but the Uganda is well worth the trouble.